The Park was very dry, but Ryans Lookout is only a short distance into the Park and is accessed from a sealed road. I set up my station, FT897 running ten watts, linked dipole supported by a squid pole attached to a Park bench. Battery power came from my 33 amp hour ‘thumper’. This battery is good when I need slightly higher power and I do have solar panels I can put out when required to keep it charging while it is in use. This picture shows my set up for this activation including the 33 amp hour ‘thumper’. I was on the air at 23:04 and called CQ on 7.110. It was quiet on 40 metres and after looking around the band and calling CQ a few times I decided to migrate to 20 metres. I spent about 25 minutes on 20m calling CQ and looking around the band. I had no contacts. I then went back to 40m. 23:33 VK5PAS s58 r57. I was glad to get Paul in the log. Jenny sent him a SMS and he kindly gave me a call before heading off to work. Well seven contacts was all I could manage. I guess many amateurs were at work, preparing for Christmas or not near their radios. Nevertheless , I appreciate those who gave me call. We packed up and began our drive to Gundagai. 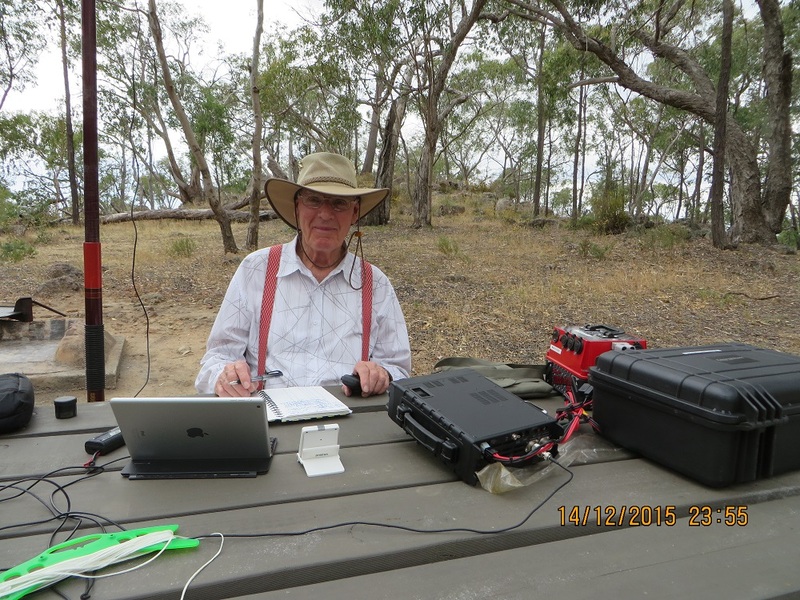 While driving from Ballarat to Horsham I decided to go back to the Grampians National Park, VKFF-0213 and try and complete my score to at least 44 stations so as to activate the park successfully for the WWFF award. After studying the maps we had we saw that the Park adjoins the Western Highway at two locations. We decided to take the first turn off, travelling West from Ballarat, following the Roses Gap Road. We did not go as far as Roses Gap. We probably would had stayed at Halls Gap but our favourite location was booked out – no surprises there, but no harm done by checking. We found a quiet spot and while Jenny went bird-watching I played radio! Internet coverage was problematic and I could not spot myself. I found quite a few frequencies which appeared unoccupied and after checking 7.090 I called CQ at 04:57 and was answered by VK3MCD/P, Brian, 59s 56r. I did not want to occupy the SOTA calling frequency and migrated to 7.105 where I stayed until moving to 20 metres. Signals were really good but some VK5 stations suggested that conditions were not as good there. 05:32 VK3PMG, 59s 56r, Mick was the closest station to me, just down the road at Stawell. 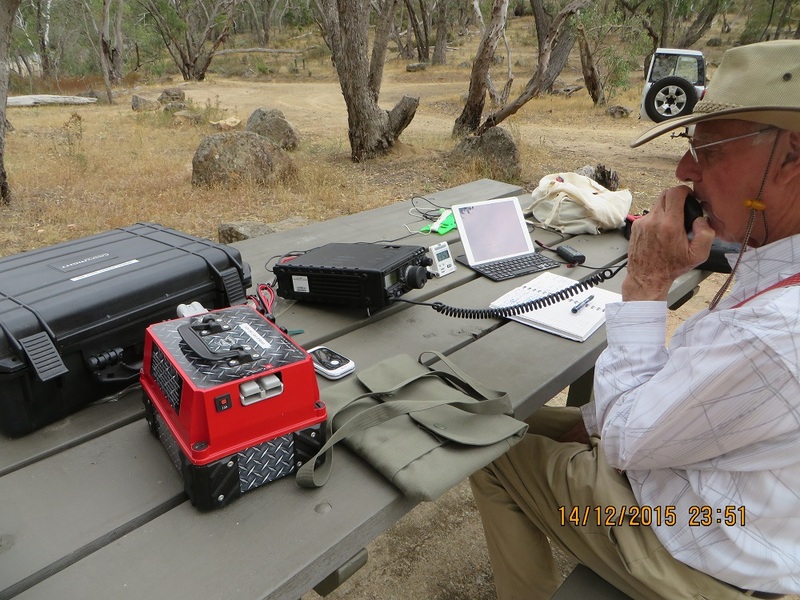 I then moved to 14.310 and heard Adam, VK2YK/P, on 13.310. I tried to work him unsuccessfully. I could hear him and heard him say he was going QRT. I took over the frequency and called CQ. I called CQ for a few more time and all was quite. There were no VK6 stations audible. I decided to return to 40 metres and found 7.110 to be unoccupied. As we were travelling on to Horsham I decided to pack up. I called a few more times after the last contact and all was quiet. Forty five contacts were made, which with my previous activation, will ensure that the Grampians National Park is complete as far as the WWFF award is concerned. Thanks for the spotters and the callers. You are all greatly appreciated. It was a fun activation. I used my FT897 running 10 watts for 40 metres and 40 watts for 20 metres. The radio was powered from my 33 amp hour ‘thumper’. The Grampians are a series of abrupt sandstone mountains that rise from the surrounding plains. Sighting the Grampians from the plains, especially from the Western Highway, is always interesting no matter what the weather.